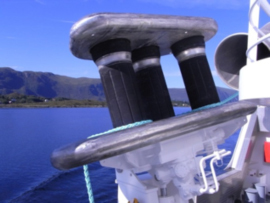 We deliver complete package of net handling system for purse seiners and for trawlers. We produce the Karm Tristar range of nethaulers. Netstackes are delivered with netroller and winch. The Gigant Tristar is the largest nethauler in the world in size and possible pull capacity. 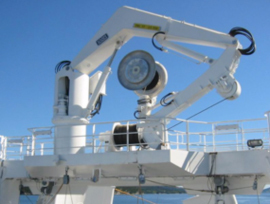 We produce several different sizes of net cranes delivered with netroller and winches. 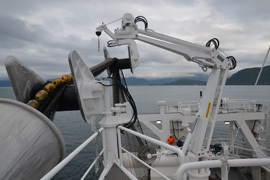 The trawl handling crane is special designed for handel the trawl. 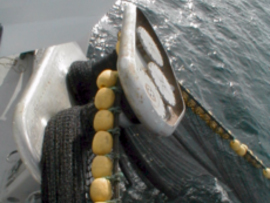 The netcrane is used typcial onboard trawlers for ease the handling of the trawl net. The netcrane is equipped with both a winch and a netroller, The crane is typical radio controlled. Our transport rollers are delivered for all sizes of purseseining. We deliver with parralell roller or V-shaped roller depending on customers requirement. e supply also transport rollers for nethandling inhouse. As a option some transport rollers can be driven electrical. Cranes to handle purse seine nets. This is developed in the Far East for handling purse seining nets for the tuna fishing vessels. The ring needles are designed with different length depending on the size of the pursenet. They are equipped with strong special steel shafts. 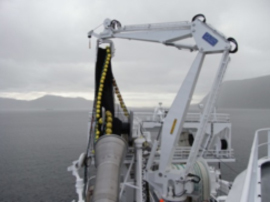 The ringneedlers are hydraulical operated and can be delivered with local control or remote control.